The 18-minute film is intended to educate the public on the need to protect the remaining corridor of undeveloped land between two of the state’s largest metropolitan areas. The free screening and panel discussion at the Tampa Theatre is an interfaith community event sponsored by Palma Ceia Presbyterian Church in conjunction with Hyde Park United Methodist Church, Bayshore Baptist Church, Congregation Schaarai Zedek, and the 34th Street Church of God. 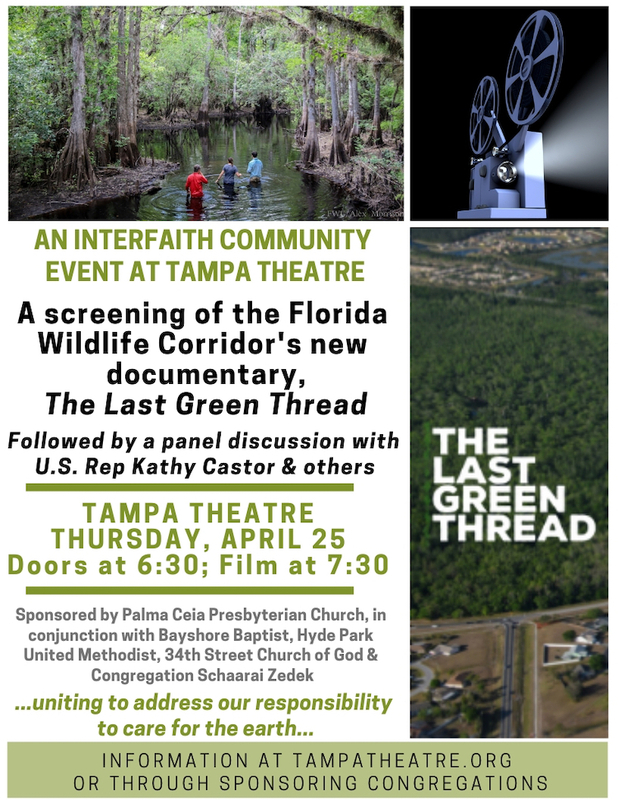 The panel discussion after the screening will include U.S. Rep. Kathy Castor, the Florida Wildlife Corridor President Mallory Lykes Dimmit, Florida Wildlife corridor founder and National Geographic Explorer conservation photographer Carlton Ward, Tampa Estuary Program Executive Director Ed Sherwood and Wellman. On April 25, doors will open at 6:30 p.m., with the documentary starting at 7:30 p.m. The event is free and open to the public. No tickets are required. More information can be found at the Tampa Theatre website.